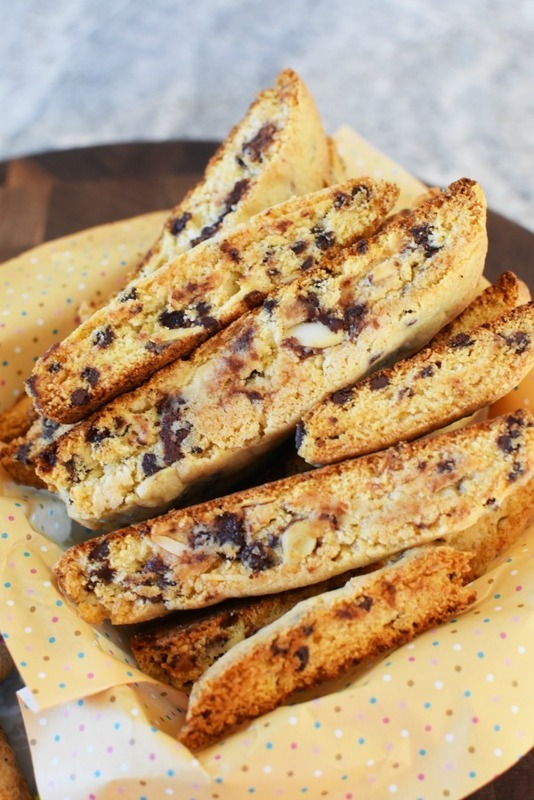 These Chocolate Chip Biscotti are extra crunchy, and delicious thanks to slivered almonds. They are perfect for a hot cup of tea or coffee. 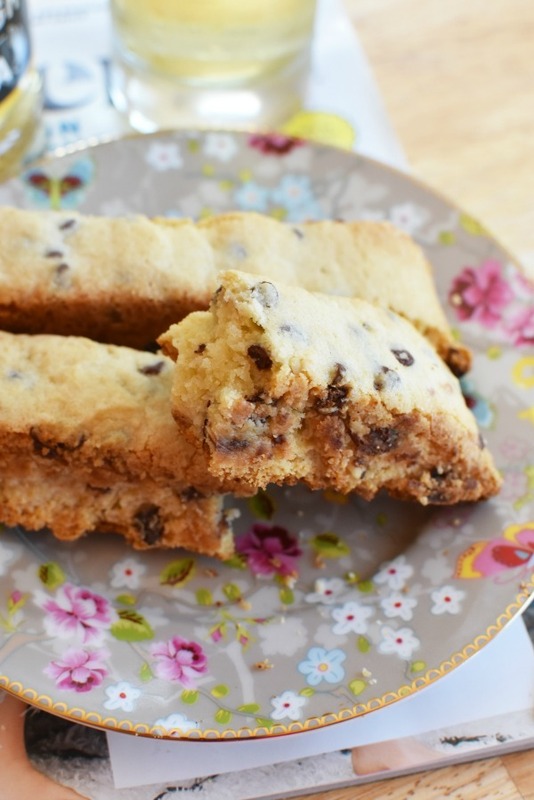 I don’t know about you, but I really love to eat my chocolate chip biscotti with hot tea. They just pair so well with a black tea and are the perfect shape for dipping. Maybe it is my inner child coming up but I love to dip my biscotti. Crunchy biscotti and hot tea are the adult “cookies and milk”. 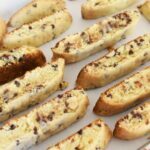 In the past, I have always bought my biscotti at the market, but one day I set out to make my favorite flavor myself, at home. 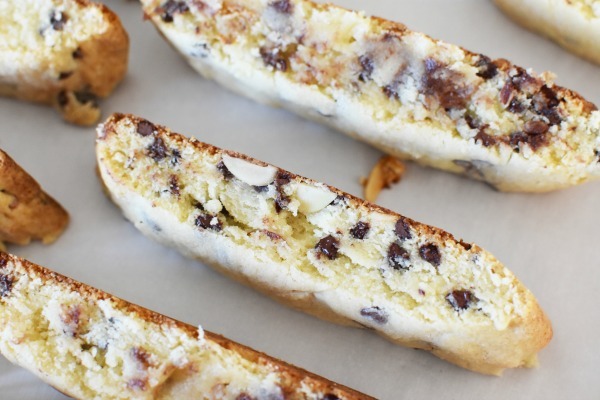 It couldn’t be that hard to bake up a batch of homemade biscotti- right? 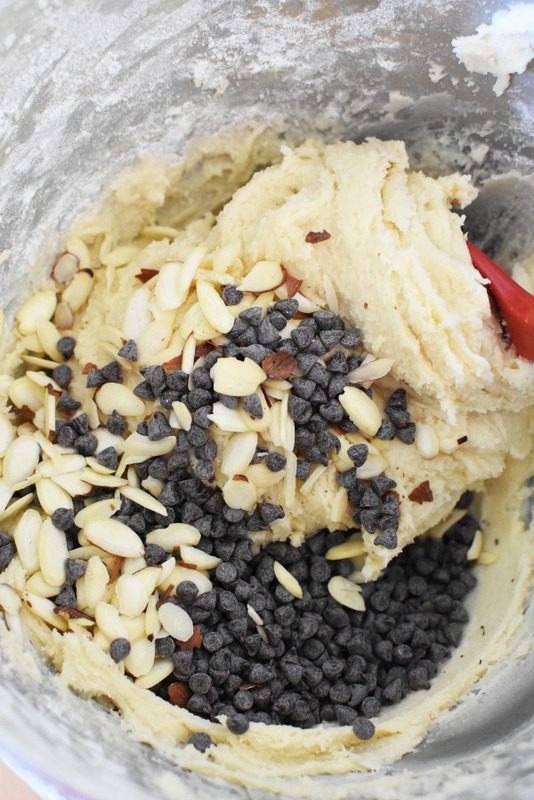 My stand mixer really came in handy to churn the chunky, buttery dough. I divided the dough into two floured balls. Then, I added a piece of parchment paper to my counter, and an extra piece to put over the balls of dough to cleanly roll them out. Making this Chocolate Chip Almond Biscotti was a more involved process than I thought. It was not a mix, bake, and go type recipe, but required a few more steps than normal. I didn’t really mind the fact that I had to really set my oven timer a few times for these biscotti because the end result was the tastiest biscotti I have ever had. 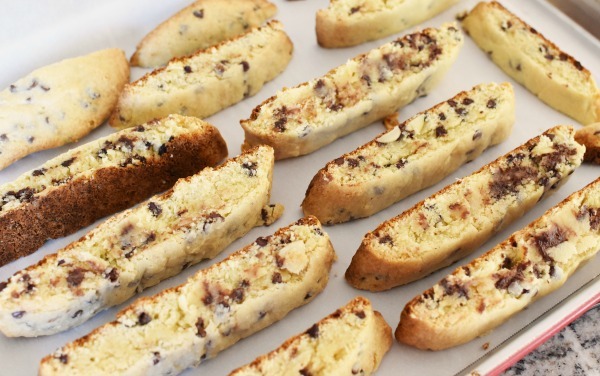 If you like your biscotti not too crunchy, then you would love this recipe. I found the consistency to have the perfect amount of moisture, and crunch. They paired well with my hot cup of tea I enjoyed afterwards. Make sure your cut biscotti are completely cooled before putting them in an air-tight container. These will go really quickly because they are so delicious, but they do keep for up to 2 weeks in a dry, air-tight container. 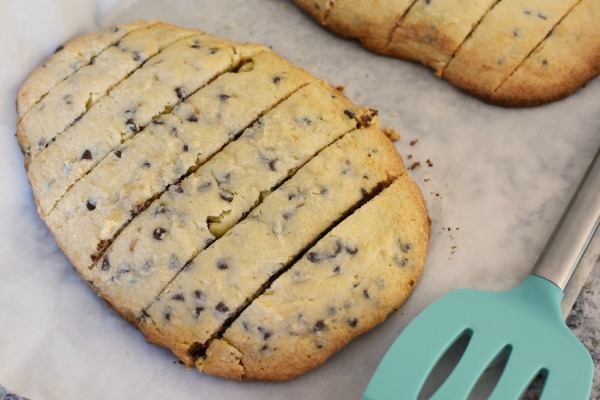 Want to recreate this Chocolate Chip Almond Biscotti? Be sure to check out the printable recipe below! A delicious, homemade biscotti recipe that has all the mouthwatering flavors of almond and chocolate which pair so perfectly together. Pre-heat overn to 350 degrees. Line a large baking sheet with parchment paper. 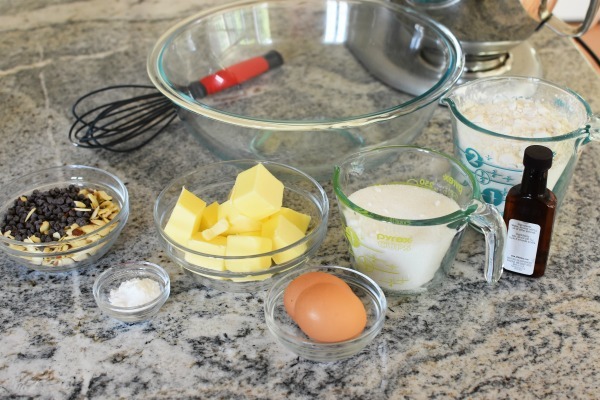 In a stand mixer, add your butter, sugar, eggs, extract, and salt. Reduce mixer speed. 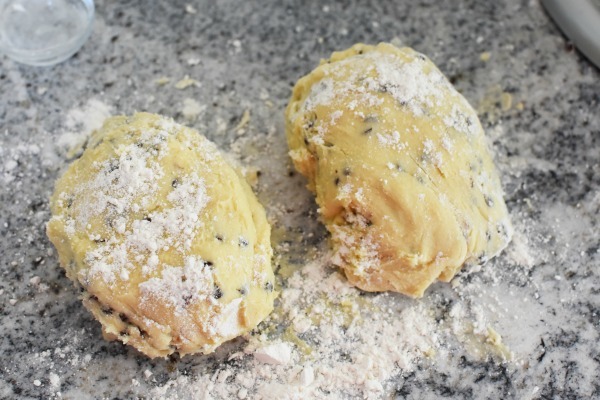 Slowly add the baking powder, and flour to the mixer. 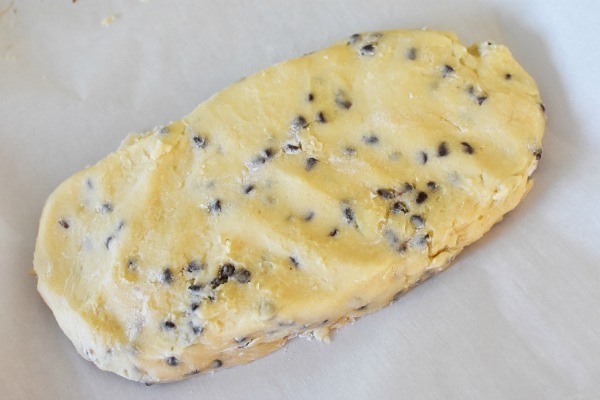 Once dough is mixed, fold in the almonds and chocolate chips. lightly flour a work area, and your hands and place dough on it. Separate dough into two equal balls. Carefully form dough to a 1 1/2 inch thick, and 10 long piece Bake for 22 mins at 350. Once done, remove from oven and allow to cool for 10 mins Carefully slice the loaves into 1 1/2 inch biscotti. Return to a 300 degree oven and bake each side for 15 mins. Once done, add to a wire rack and allow them to cool. Serve with some tea or coffee. Yum! I love biscotti but have never tried to make it myself. I cannot wait to give this recipe a try! I love biscotti! I cannot wait to try your recipe- perfect to go with my Fall morning coffee! This looks yummy and easy. 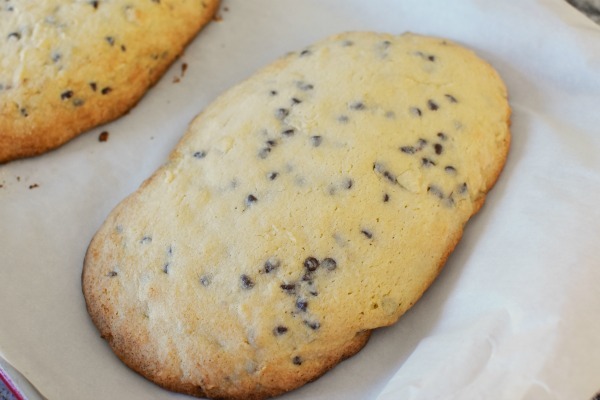 I have never tried to make biscotti…until now. There is nothing better than a delicious biscotti with a hot drink in the morning. I am going to have to try this recipe ASAP! Well now I need to make this! WOW! That looks great and it looks easy to make! We love eating these with our coffee in the morning! I love biscotti! It’s so fun to have some with tea. This will be so good with the Straight Up Sweet Tea. I love biscotti and yours looks delicious. I’ll have to make some soon. I would love to try this tea. I wonder if we have it here. And that biscotti is simply scrumptious looking. I think making biscotti would be a lot of fun! I love almonds and chocolate together so I’m sure this would taste amazing. I can’t eat almonds unfortunately. However the Straight up Snapple Ice tea is right up my alley. I need a day with my girlfriends. Chatting over tea and biscotti sounds like a lovely way to enjoy each other’s company. Ooh I have never seen how these are made, love how they came out. Yumm!! I made these cookies they came out delicious!! ? That I’m making another batch.